A giant screen above the Forever 21 store in Times Square, New York is showing a creative execution that takes live elements from the surrounding street scene. A girl appears on the screen & amp; turns to take a photo of the crowd below. She shakes a Polaroid which then contains the photo that she appears to have taken. Crowds were captivated by this relatively simple technology and stared at the screen for up to 20 minutes! Unilever, in conjunction with SapientNitro, has developed the world’s first ‘smile-activated’ vending machine which rewards grins with free ice cream. The user is prompted for a smile, a photo is taken and uploaded onto Facebook and the consumer can then pick their free ice-cream by using the touch-screen interface on the vending machine. The Pirata Boat Race is a game whereby players uses their i-phones as the controllers. Historically gameplay via mobile is achieved using IVR (Integrated Voice Response) where the player dials into a number and a touch-tone mechanism allows them to use the keypad into control an OOH screen. To play the boat race however, users download an app, snap an on-screen QR code using their camera phone which logs them in and then multiple players can compete by ‘rowing’ their phones to power the boats. There are a huge range of OOH screen locations, both large & small that could allow such gameplay. As with many of these types of installation it’s the context that makes it fun, appealing or interesting. The same technology in an different environment such as a website or on a gaming console would seem pretty unexciting whereas projects such as our live webcam stream to a London Underground station or touch screen games in bus shelters proved to be incredibly engaging. A number of brands have used gesture based gaming installations in out-of-home locations such as retail unit windows but this example has the added mechanic of allowing players to throw things at screens which could add an extra bit of fun to an experiential marketing project. A German research scientist has built an application that allows an i-phone user to digitally alter the appearance of a façade. Users simply aim their device at the building causing the viewfinder to show the façade on-screen which the user can then paint in different colours. This is then replicated on the actual building. 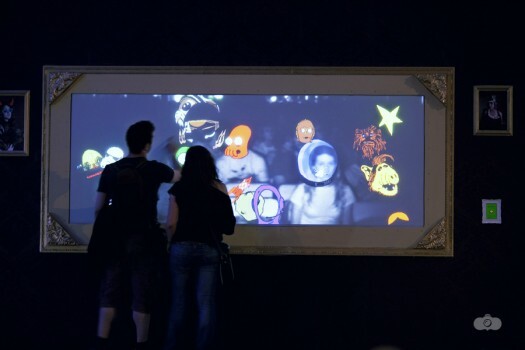 The 2nd video shows a similar approach using a higher definition OOH screen as a virtual blackboard which replicates what’s drawn on the i-phone screen.